At age 81 my old hands are just the tip of the iceberg when it comes to aches and pains. However I feature them here to make a point. Over the past few years I’ve lost most of the strength in my hands and it was getting harder and harder for me to open jars. I had resorted to some of the old standbys … turning the jars upside down, tapping all edges on a hard surface and twisting as hard as I could … adding a rubber band to the cap, hoping it would provide needed traction … running the jar under hot water, etc., etc. ; but, all these practices rarely did the job and it was extremely frustrating. However, all was not lost, I found a simple but very effective opener that works perfectly for me. It’s the Maddagrip Opener and I am amazed that this simple device has given me such relief. I can easily open anything from small vials to large jars and my arthritic hands seem almost like a thing of the past as I grip with this device. Now I can forget about the weakness in my hands and rely on my new “toy”. It sure beats waiting for a strong man to come by and open those pesky jars … I could starve by then! Boredom … the deadly foe. Many years ago, while in my teens, I complained to my mother that I was totally bored. I will never forget her answer and how it has affected me for the rest of my life. She said, “did you ever stop to think that bored people are very boring?” I didn’t like that answer. Not only did it make a lot of sense … it made ME the boring one ! 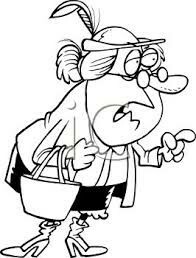 My mother suggested that I visit our elderly neighbor Mrs. Whitely and, although I couldn’t imagine how that would help, I decided it would be better than sitting there feeling sorry for myself. I made up a little plate of homemade cookies and, reluctantly, made my way across the lawn. Mrs. Whitely was surprised to see me but seemed very pleased too. She ushered me into her living room and insisted that we have a “tea party” to go along with the cookies. She told me to make myself at home while she steeped the tea so I spent the time wandering around the room trying to make sense of everything. I felt like I was in a museum and, in actuality, I was. To make a long story short that was the beginning of an amazing friendship. Mrs. Whitely was in her 80’s and, although she had been widowed for many years she recalled how she and her husband had traveled the world for his business. Everything in that room was in remembrance of those years and she was thrilled to share it with me. Now I am the one in my 80’s and I reminisce about those magical days spent with Mrs. Whitely. She was a very wise woman, as was my Mother. They taught me that boredom is a trap and the best way to avoid it is to get out of ones self … like visiting a neighbor perhaps ? This is another article about something that a good friend recommended but that I have not yet tried. 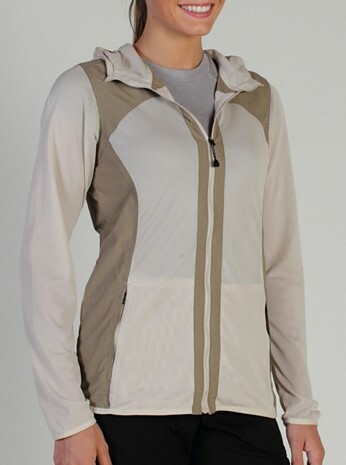 I’m referring to her insect shield jacket and pants by BugsAway®. My friend is definitely an outdoors person. She is an avid gardener and takes long walks with her bird-watching club. She loves the fact that she can put on her lightweight jacket and know that it will repel mosquitoes, ticks and other insects. She can even pull up the hood and it will protect her ears and face and if she combines the jacket with the pants she has total head to toe protection. The pants are light weight too and if she gets them wet while out in the early morning dew she doesn’t worry. 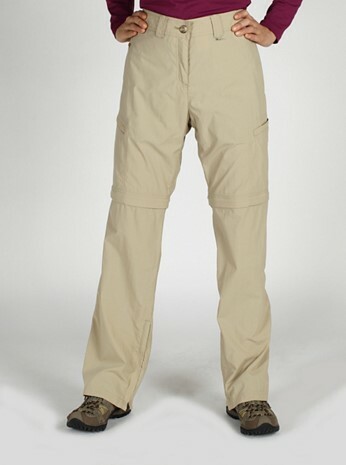 They dry quickly and have the added advantage of zippered pant legs. When the day gets hot she can simply zip off that part of the pants leaving her with an attractive above-the-knee pair of Bermuda style shorts. She did tell me that her BugsAway® clothing, specially treated with Permethrin, is not inexpensive, however the insect shield repellent lasts for 70 washings and gives her the comfort of knowing that she doesn’t have to worry about diseases from ticks or other insects. That alone makes it worth every penny ! Old Wives Tales are often myths that are thought to be untrue or not based in fact. However I grew up in the Depression years and the Old Wives Tales that I remember most were the ones that we DID test over and over and found them to be true. They were the ones that saved us a bunch of money by utilizing items common to every household. So, whether they are Old Wives Tales or not I still think of them as such and thought it would be fun to list a few of them here since I know we all like to find ways to save money. Living plants in the home are natural air purifiers . You don’t need to buy those costly Brand Named scents that often seem to overpower you with their fake aromas. Specific varieties that work best are rubber trees, corn plants, bamboo palm, ficus, English ivy and philodendronss. Forget window cleaning sprays. Saturate a cloth with inexpensive white vinegar straight from the bottle to wash your windows and then use newspapers to absorb the liquid. The fibers that make up newspaper are denser than paper towels and don’t fall apart so easily. I also grew up being told that the printers ink in the paper helped to bring out the sparkle in the glass but that I can’t prove. I only know it works ! Unclog your drains. This one does use a Brand Name item but it’s still a lot less expensive than the heavy duty products. If your clog is not too severe this works great. Just dissolve 4 Alka Seltzer tablets in a cup of vinegar and flush down the drain with boiling water. Removing furniture scratches. This is one of my favorites and all it takes is a nutcracker and some walnuts. Remove the nut from the shell and rub it over the marks in the wood. The oils from the nut will penetrate the surface and remove the scratches. This works well on all varieties of wood ! So, there you have it. I hope I’ve tempted you to write to us and share some of your own money saving home ideas. My friend went on to say that her husband has suffered from foot pain for years. His doctors couldn’t find a name for it and most just attributed it to old age. However the aches and burning feet were (and are) a reality and he was very happy to say that the Conair Waterfall Foot Spa with Lights, Bubbles, and Heat has been a life saver for him. This is a very long name for a FOOT BATH but he feels that this particular one deserves a big title since it does such a big job for him. Once, or sometimes twice, a day he fills it with warm water and slips his tired, achy feet inside. 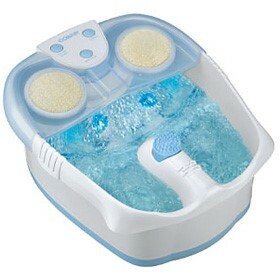 Then his toes can activate the controls which give him high or low bubbles and also a waterfall effect that he says is very soothing to the top of his feet especially. Then once a week his wife gives him a special Spa treatment. After his usual soak she uses the attachments that come with the Conair foot bath… the pumice stone, scrub brush and massager…on his feet. I think the Spas call this Hydrotherapy but I prefer to think of it as one way for a wife of over 50 years to tell the old guy that she still loves him ! coddled in a spa ! Within 30 minutes to an hour my tired and sore muscles seem to fade away. I also treat headaches in this way. Before using the pillow I would take Tylenol or Motrin but I really didn’t like taking pills and it was a great relief to find that if I brought the pillow firmly around my neck and let the moist heat concentrate there my headaches would often disappear. Chronic aches and pains seem to be a part and parcel of old age … they can be bothersome but don’t often warrant a trip to the doctor. It’s at those times that I pull out my Bed Buddy Pillow and put it to work. Aaaah…the relief of that moist heat. I highly recommend it and hope it will do the same for you. Every Christmas I get the “What do you really want?” question from my children and I usually have a wimpy sort of answer like … “whatever you give me will be great.” But this year I decided to answer that question honestly and I did. 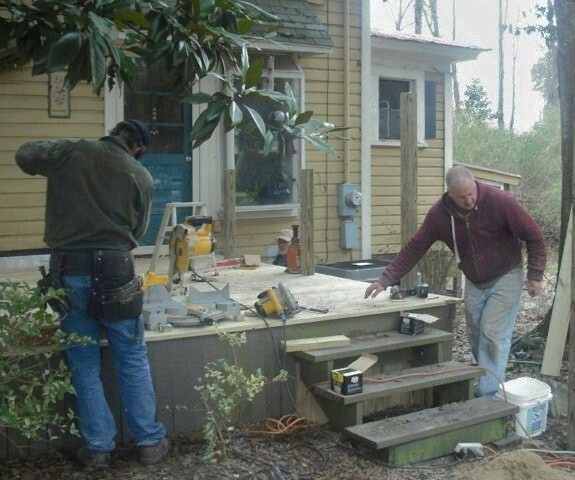 I told them I would be happy to buy all the material if they could build me a new deck to replace the one that I’d had for over 30 years ! Well, they were delighted and in March the weather man promised a few warm and clear days and they went to work. In the picture you see the three of them in action. That’s my oldest son on the far right, my middle son (in the white hat) under the window and my son-in-law on the left. …it’s like having my old deck back but with a very important change …I now have a substantial railing and that is critical for me. I actually spent years without a railing and I remember the many times that I slipped on ice or wet leaves. It’s a wonder that I didn’t break something or fall off the deck ! 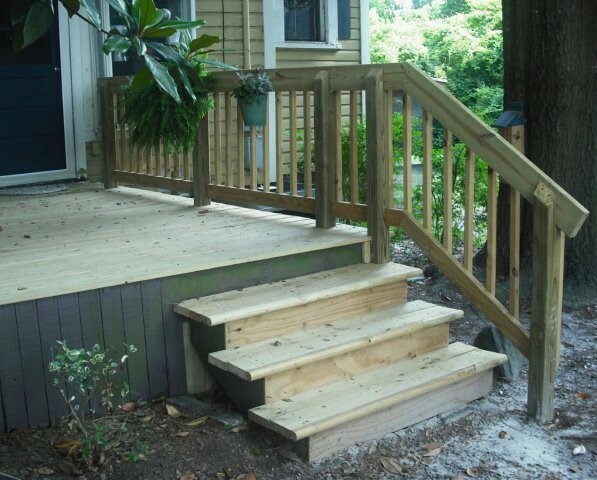 So, if you have a deck without a railing think hard about adding one onto it. There are so many options to choose from and your kids will rest easier knowing that you’ll be safe in any weather.